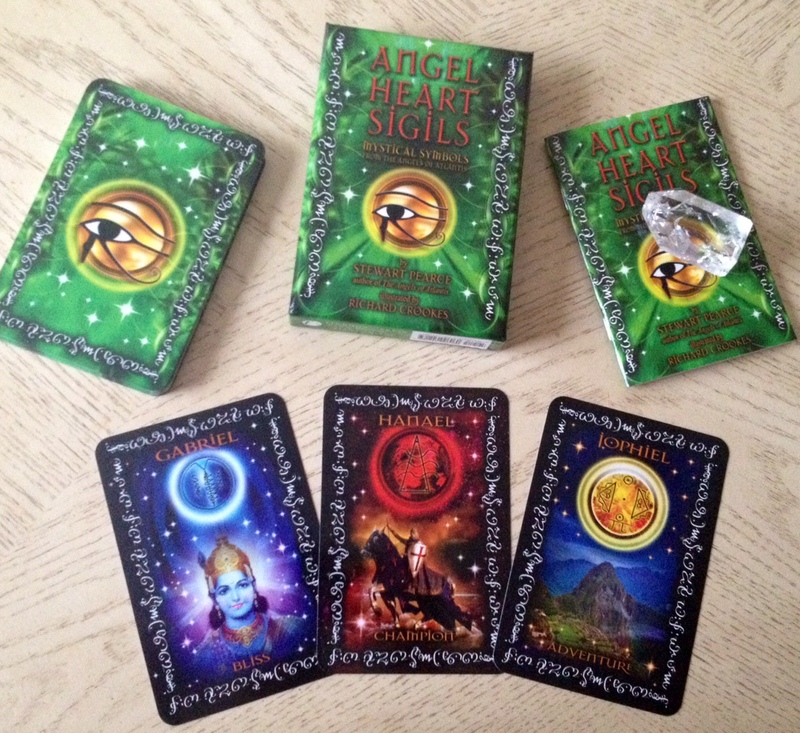 Angel Heart Sigils is in the genre of angel oracle decks, though as an “angel oracle deck,” it’s probably not what you think. 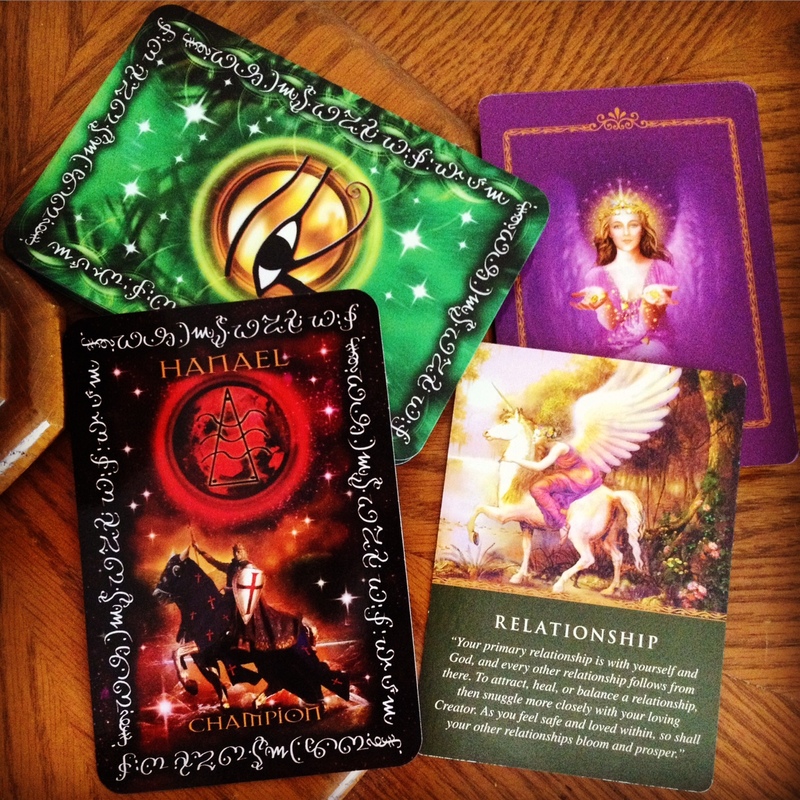 For instance, just compare it to last week’s review of the Daily Guidance from Your Angels Doreen Virtue deck. It’s so different from what most of us tarot practitioners have come to understand or presume to be an “angel oracle deck.” This deck doesn’t come out of one of the typical tarot and oracle deck publishers. It’s by Findhorn Press, a Scotland-based independent mind, body, spirit book publisher. The deck– Angel Heart Sigils: Mystical Symbols from the Angels of Atlantis– is by Stewart Pearce, who is a voice coach, sound healer, and angel medium who, according to his biography, has worked with Princess Di (and several other celebrities from the British Isles who I don’t think I recognize simply because I’m an ignorant American). The deck is based on Pearce’s book, The Angels of Atlantis (Findhorn Press, 2011), which is about the 12 archangels of Atlantis, and also The Alchemy of Voice, published just one year before Angels of Atlantis, that chronicles Pearce’s initial contact with the 12 archangels. The illustrator is Richard Crookes, who started his artistic career in watercolor and pencil, but is now into digital art, photography, and map and diagram illustration. In the Angel Heart Sigils deck, you’ll see that digital art, photography, and diagram illustration side. A quick scan through his portfolio will convey an incredible digital artist of the modern age who has designed some very cool book covers and can render some extraordinarily beautiful calligraphy. When I first saw this deck online– and here would be my own misread– for some reason I thought it was going to be featuring Enochian angel sigils and integrate the works of John Dee into an angel oracle deck, which I thought was super cool and therefor got super excited. I don’t know why, but when I saw the script along the borders of the cards and along the deck box, I mistook that for Enochian script and only upon closer examination, realized nope. Oops. Ma bad. What this deck really is, based on my understanding, is the memorialization of angelic messages from the 12 archangels of Atlantis (a concept I must confess I am wholly unfamiliar with) relayed to medium and angel channeler Stewart Pearce. 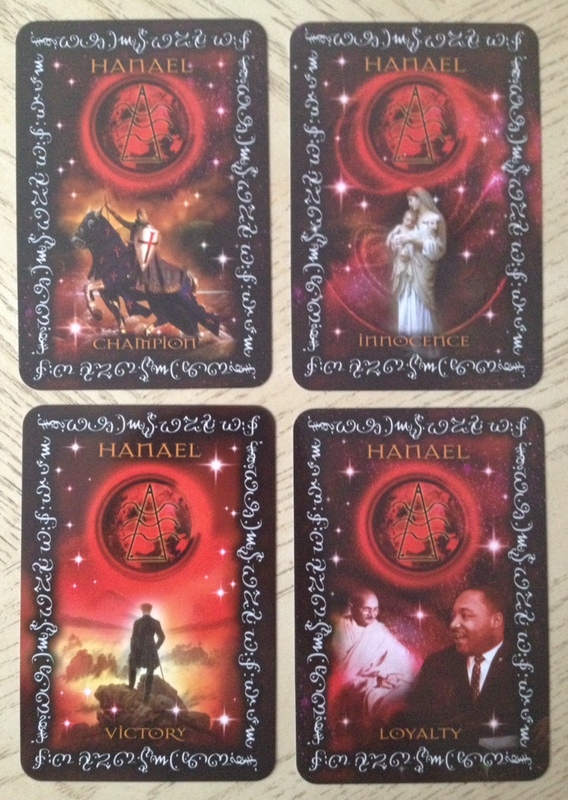 There are two decks that come as a pair, this one, the Angel Heart Sigils, and the Angels of Atlantis Oracle Cards. The two together “represent the two pillars to the Temple of the Angels of Atlantis” (from the back of the box). Angels of Atlantis, which is not pictured here and which I do not have, activates the left hemisphere of the brain while this deck, the Angel Heart Sigils, activates the right hemisphere. I didn’t know this before getting this deck but perfect! I could use some work and training on activating my right hemisphere. As for the angelic script, I presume it’s a script developed by Stewart Pearce from his angelic communications not unlike the Enochian script that John Dee developed through his own mystical work. 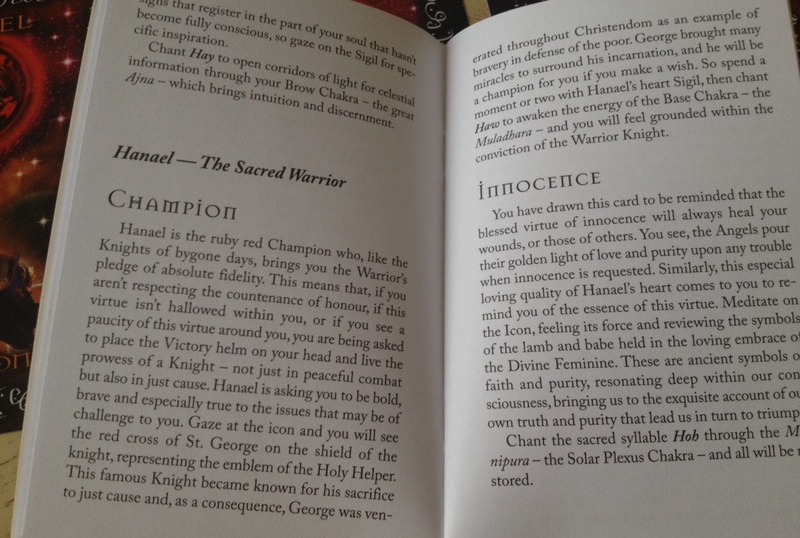 However, that is pure speculation on my part, as the corresponding guidebook that comes with the deck doesn’t really give much background on the nature of the script pictured or how the angel sigils were conceived. On the accompanying guidebook, I would contend that it gets very religious. A clear and distinct religious point of view emerges. I’ll show you what I’m talking about later in this review when I demonstrate some of the divinatory techniques instructed in the book. There are 44 cards in total, at about 3.75″ x 5.5″. There is a glossy finish to the cards and the stock quality is decent. 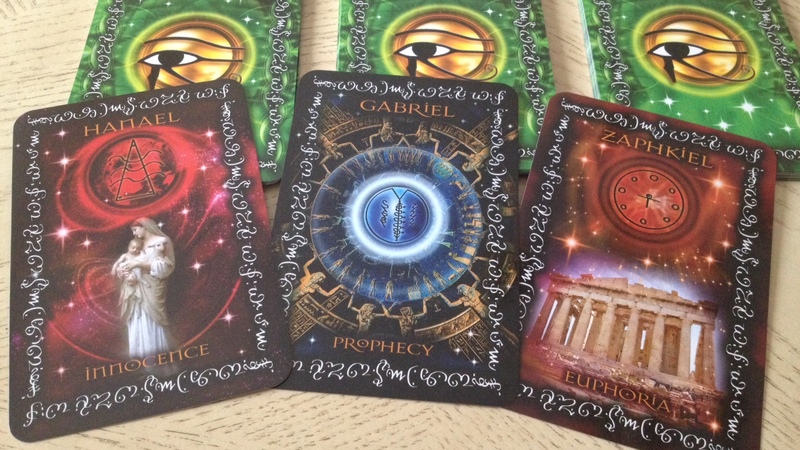 As far as I could tell, both the front and back of the cards are bordered with the same ordering of angelic script, though I do not know the source of the script, whether it’s Enochian (I don’t think so) or is a script that Pearce developed through his channeling and mediumship work. As for the deck’s artwork, it seems to be a collection of both original photography and licensed photography, and some older works from the public domain, all put together in digital collage form plus the digitally added little white stars. In the deck art, I guess the digital white stars is okay. I know that judgment is entirely subjective and most people, such as you who are reading this, are not likely to find the white star detailing problematic. For me, it just feels like an artistic addition I would have thought of in junior high while playing with Photoshop for the very first time. The art here matches the keywords to a tee, so I do love that. You don’t need to look at the keyword to know exactly what is being conveyed in each of the cards. The selected works of art and photography span the entire gamut of world history and you start to see some of that in the above photos so far. You’ve got images of the Knights Templar, and then Gandhi and Martin Luther King, Jr. You’ve got deific representations from both Eastern and Western religions (though I didn’t see any clear representations of Islam, which is odd, given the angelic nature of the deck and how many of these named angels are part of the shared tradition of Christianity, Judaism, and Islam). Anyway, the creative diversity is really cool. Without handling the deck, I would have thought that a card deck with both da Vinci’s The Last Supper and contemporary photographs of fireworks and holiday vacation retreats (you’ll see it in later photographs, specifically “Idyll” and “Luxury”) might not come together cohesively, but Crookes has rendered a deft hand and done so with ease. I don’t find the diversity of art in this deck disjointed at all, as I would have expected. Instead, it all works together so well and really gives the deck a feeling of transcending space-time. In the above sampling of cards from Metatron, the top left card per the guidebook is titled “Adoration” (although the keyword is missing from the card, which I don’t know whether is intentional or not) and depicts a monstrance, with the card message urging the seeker to reflect on whether her own life process welcomes the flow of Christ light and source energy into her body. 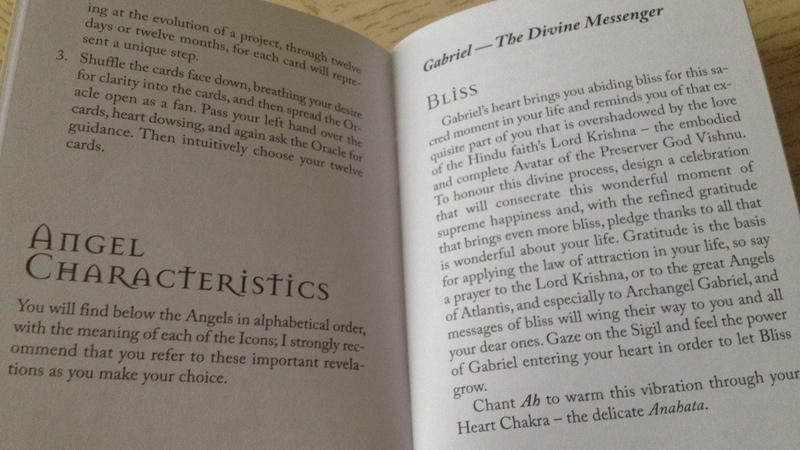 Also, throughout the guidebook, Pearce’s work as a voice coach comes out and there are helpful insights into the sounds associated with each card intended to stimulate certain chakras. The “Adoration” card, for instance, corresponds with the chant hee through the crown chakra. I would have liked to see more background information on the angel sigils depicted on each of the cards. It seems the same sigil repeats throughout each of the cards in every angel “suit,” or clustering of cards assigned to one of the angels. Most have 4 cards per angel, though some have 2, as you will see. I also appreciate the color correspondences intended to help along stimulation of certain chakras. Gabriel, the Divine Messenger, radiated blue from his sigil, for the throat chakra and communications. Hanael, the Sacred Warrior, radiated red, for the base chakra–survival, physical strength, endurance. 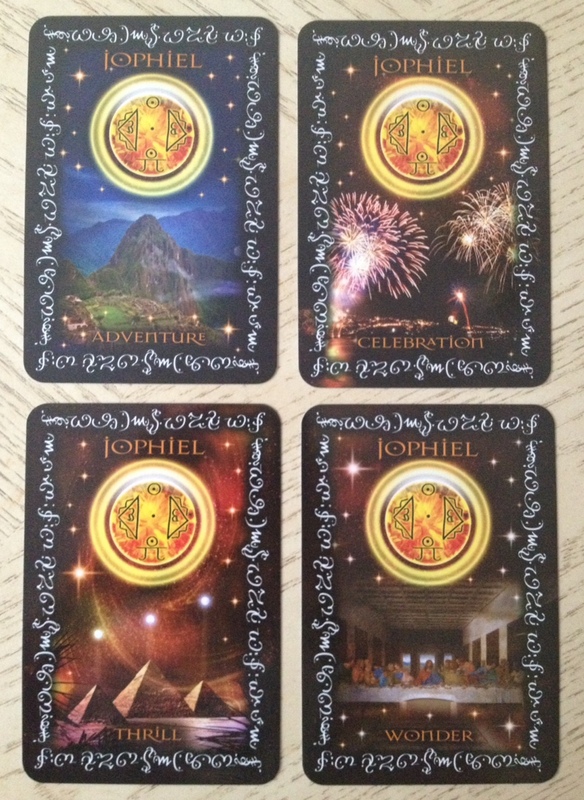 Jophiel, the Holy Liberator, with the sacral chakra. Metatron, the Supernal Teacher, with the corwn chakra. 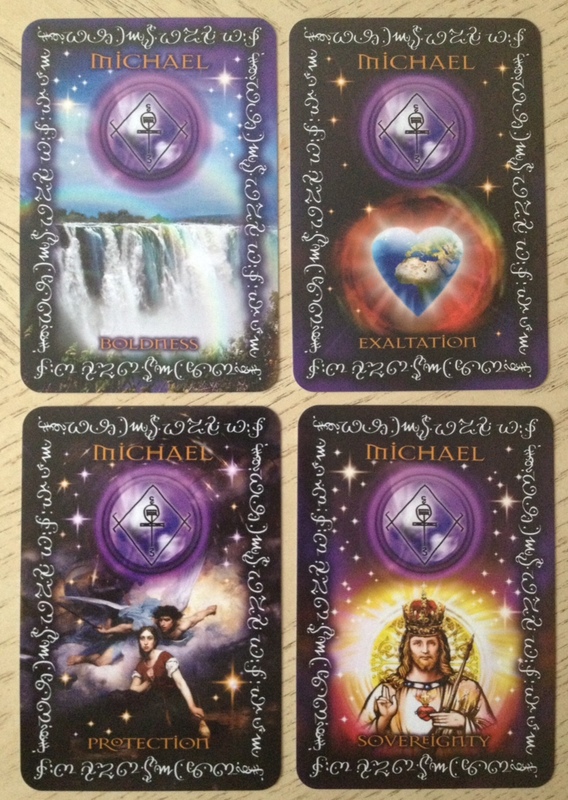 And here, the angel Michael, the Cosmic Leader, with the third eye chakra. 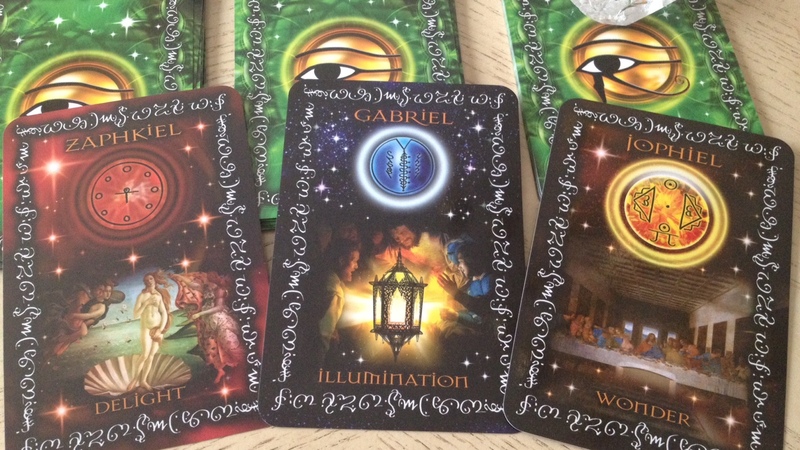 Interestingly, each card within an angel “suit,” per the guidebook, also resonates with a different chakra. 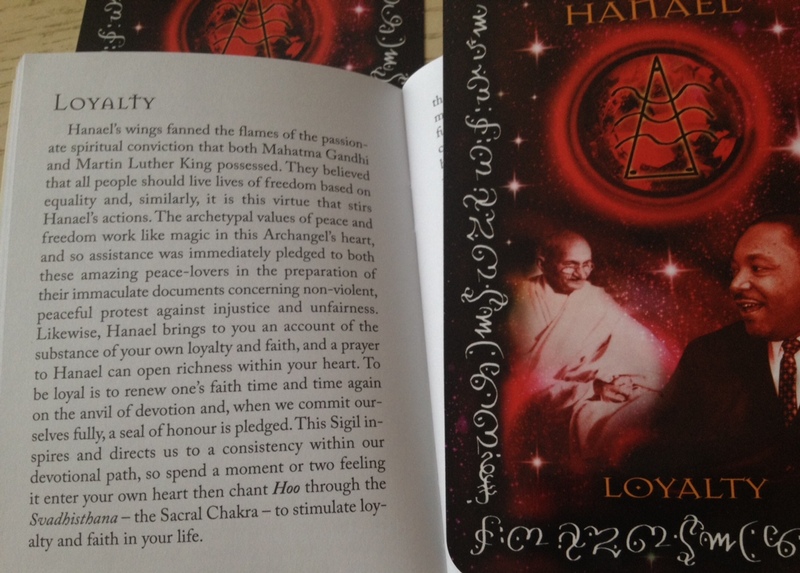 Thus, for example, even though the card “Sovereignty” under Michael is the third eye chakra, according to the guidebook, chanting ha will acticate your heart chakra. The preceding card “Protection,” for instance, through the sound hee would activate your crown chakra. So I confess this is a little confusing to me, but I’m probably just not smart or spiritual enough to get it. Notice how the cards that keep the white digital stars to a minimum look the most balanced and pristine. For instance, the card “Embrace” under Raphael, pictured above. Or the earlier “Boldness” under Michael. Artistically, those digital stars just give me a teenage-girl-discovers-Photoshop-for-the-first-time aesthetic. Again, I know that is purely subjective. There is a strong 21st Century New Age consciousness to the deck that captures perfectly the spiritual zeitgeist of today. It’s an assemblage of current political photography, classic art, religious art, profiles of key thought figures, mythic creatures, historic landmarks, and, well, even tourist/vacation photographs, like “Idyll” (pictured above) for Uriel or “Luxury” (pictured below) for Zadkiel. According to the guidebook, the sigils represent the hearts of their corresponding angels and are magical symbols that, through the corresponding chakra, will open you up to a direct connection to the sacred. The deck’s point of view is without a doubt rooted in 16th and 17th Century Christian mysticism, at least to a significant extent. The occult is blended with 20th and 21st Century political, landscape, and visionary photography plus a guidebook that gets very “love and light,” talks about chakras and karma, and the Divine Feminine. I absolutely see why the Angel Heart Sigils deck is for the right-brained. It’s a free-flow of ideas and religious iconography, looking at arts and culture holistically, over the span of human history, and is far more about the inner child and creative imagination than it is about any form of linear sequence (which would be left-brained). 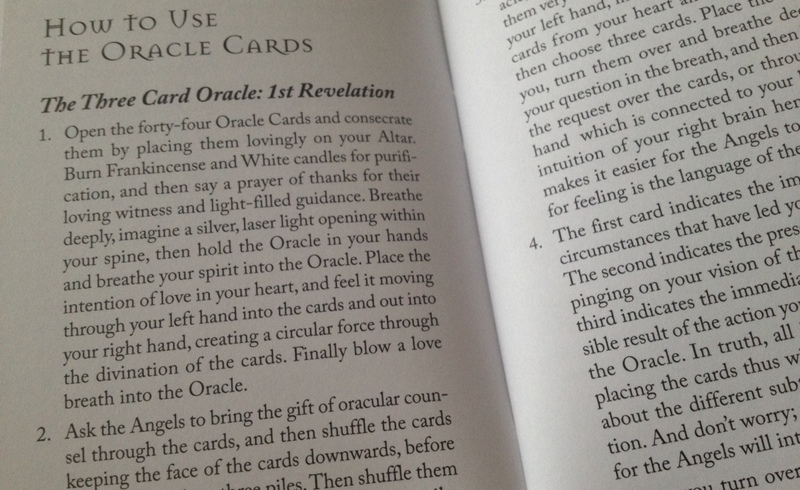 So true to the deck description, the Angel Heart Sigils oracle cards really is for the right-brained. So now let’s see whether I can connect with this deck through the divinatory instructions from the guidebook. A two-step process is taught, the first referred to as the First Revelation, and the second, well, the Second Revelation. I love the unabashed religious perspective of the deck. Very specific instructions are given, such as burning frankincense and lighting white candles. Having both on hand, I followed Step 1 for the First Revelation. Here I’ll be doing a general reading for a friend (though I won’t actually be providing the reading; instead, we’ll use it to comment on how the deck reads for me). For the First Revelation, the cards are shuffled and cut into three piles twice. Then three cards are drawn and read. 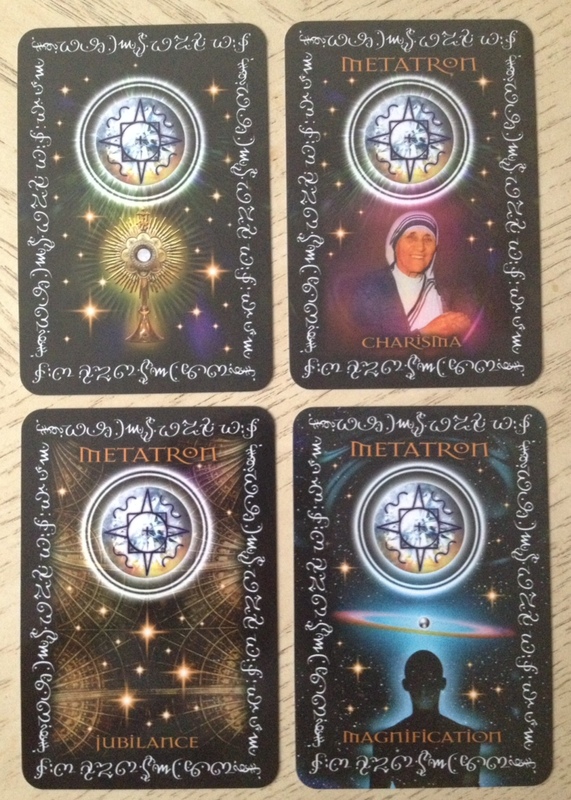 The three cards express the seeker’s past, present, and future timeline, but Pearce is clear to note that all three cards are also insights for the present. The way to read the cards must be fluid, and not limited by card position meanings. 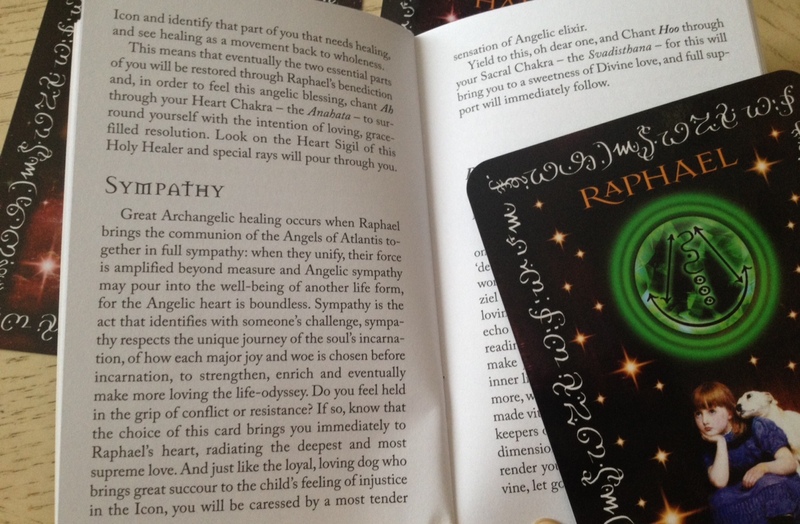 Here, before looking up the Raphael card in the guidebook, I saw “Sympathy” as indicating sympathy (or sympathetic) magic, and having that practice bearing relevance in the seeker’s life. Anyway let’s proceed. It is an interesting synchronicity that this first card “Champion” carries strong messages of loyalty (fidelity) and the second card drawn is “Loyalty” itself. Now, the writing here in the guidebook is spectacular. I love that it gives details into the images depicted on the card. Here, with the double emphasis on the base chakra, I see that emerging as a focal point for the seeker. 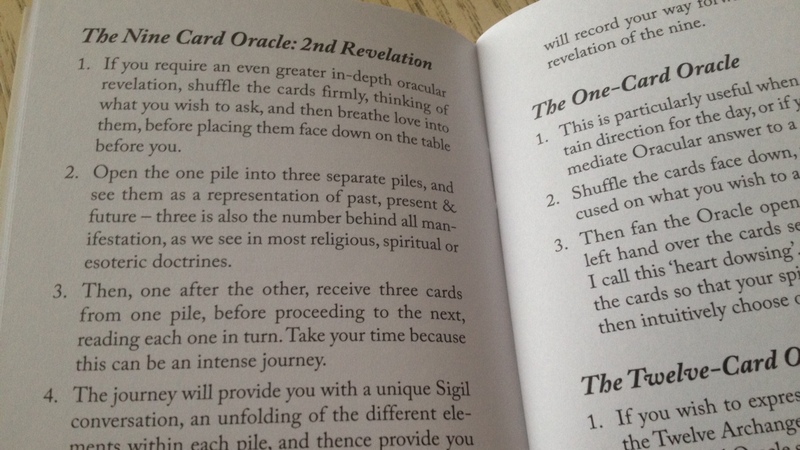 The Second Revelation is a nine-card oracle, and the guidebook explains the significance of the numbers for each of the revelation steps. I also found that, up to this point, I haven’t really been integrating the sigils, which seems to be the heart of the deck, into my reading. The guidebook doesn’t provide much instruction either, on how one might go about integrating the sigils into divination. 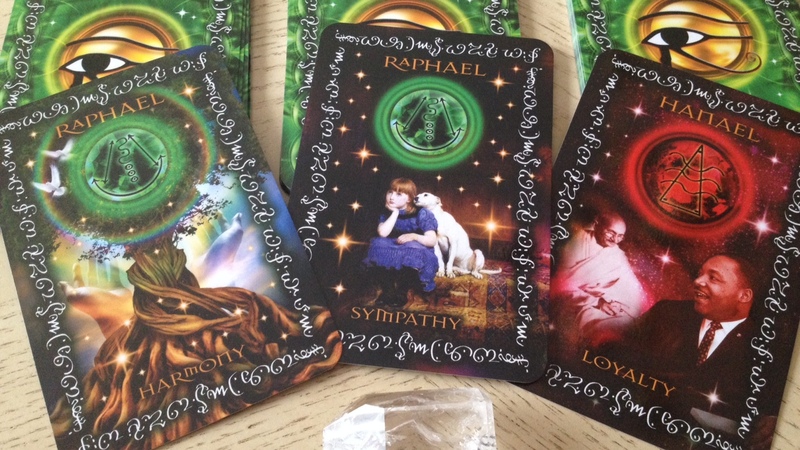 Perhaps they’re like calling cards, and when they turn up in a reading spread, activate a direct connection to the corresponding angel. That angelic energy is then brought down to assist in the divination. At least that’s my best guess. Here, the cards are cut into three piles, and three cards are drawn for the first pile. I went left to right, though I suppose the “correct” way would have probably been to go right to left. Oops. Fortunately it should be fine, since the reading process is to be nonlinear and fluid. I confess I found myself struggling with this deck. The component that most draws me reading-wise would be the chakra correspondences and synthesizing them with the keywords on the cards. 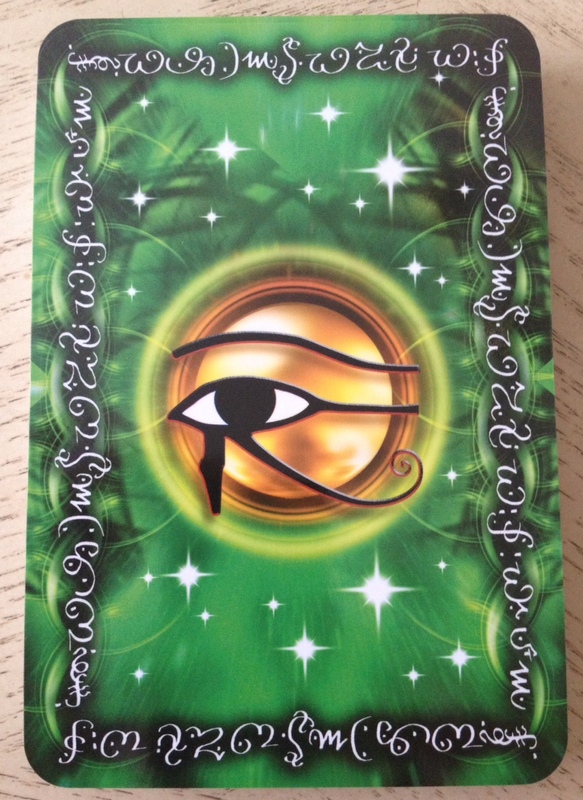 The Angel Heart Sigils deck is a deck I am going to have to study with for a significant duration of time to help me improve my ability to tap into my intuition through my right hemisphere. [I tend to be left-brain dominant.] That said, I am now very intrigued by what the Angels of Atlantis Oracle Cards, which is intended for the left hemisphere, will do for me. I swear I shuffled the deck thoroughly. From the middle pile, “Sympathy” and “Loyalty” appeared side by side again. The cards to stick to each other a bit, so for future references, when you shuffle, shuffle earnestly and be wary of sticky cards. I love, love that card “Illumination,” by the way. 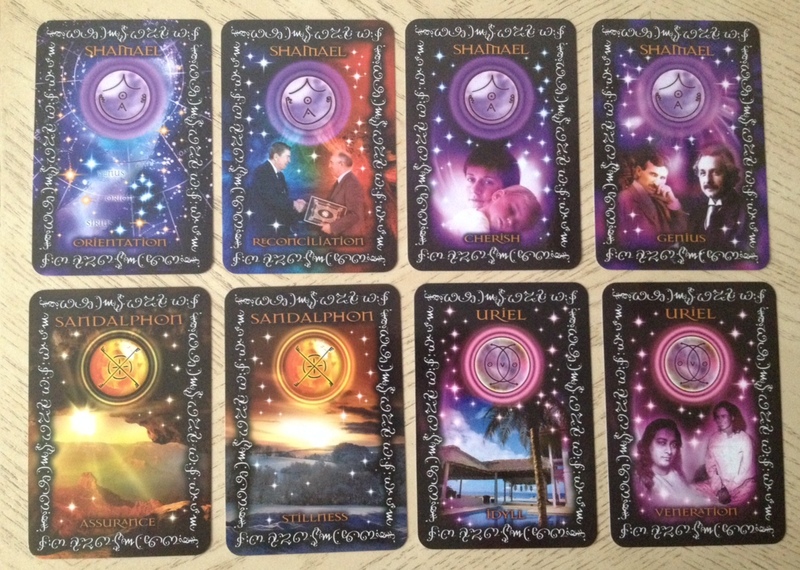 As for the angelic sigils, I thought the deck would include information on how to use the sigils, but it seems that part has been left open-ended for the practitioner to discover and develop for herself. Finally, you have the option of closing the divination session with a 10th card draw. 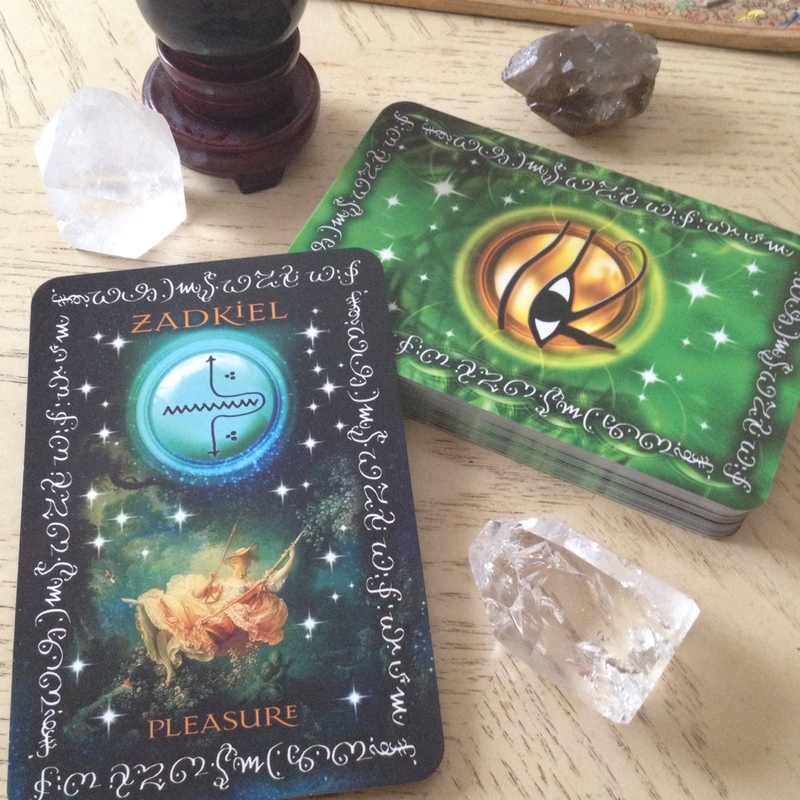 I did that here and pulled “Pleasure” under Zadkiel, the Divine Comforter. The art here is from an 18th Century painting. This is a card about the biological intention for experiencing physical pleasure. The final message? Pursue your pleasure. Find happiness and joy in what you do. Don’t get stuck by worry. In terms of oracle decks, I don’t own anything like this deck and I love that. It has a distinct and unique point of view. I don’t even know if I can compare it to any oracle decks out on the market right now. 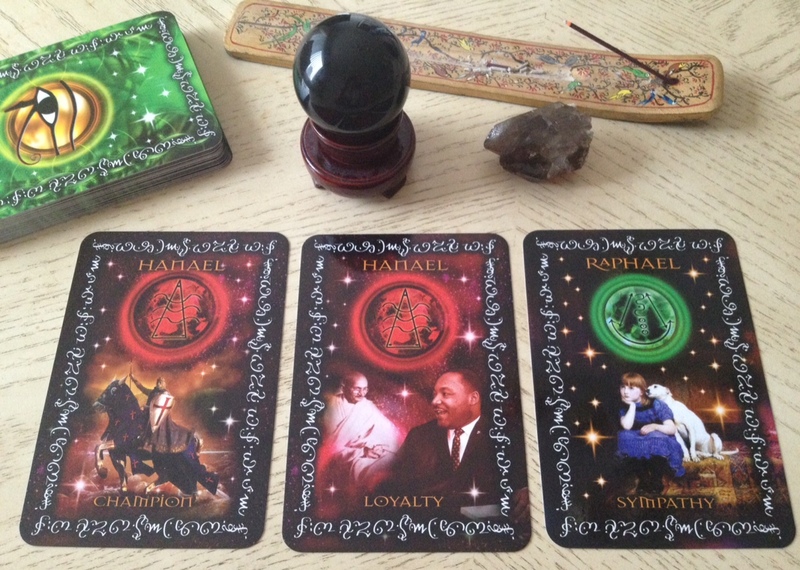 I would say if a deck like John Holland’s Psychic Tarot for the Heart oracle deck and the angel and archangel decks out on the market right now all pique your interest, then the Angel Heart Sigils deck is going to be a great next step. Initially, seeing the sigils on the card images I came across online (and before I read any of the deck descriptions carefully), I got the impression this might be an esoteric oracle deck. 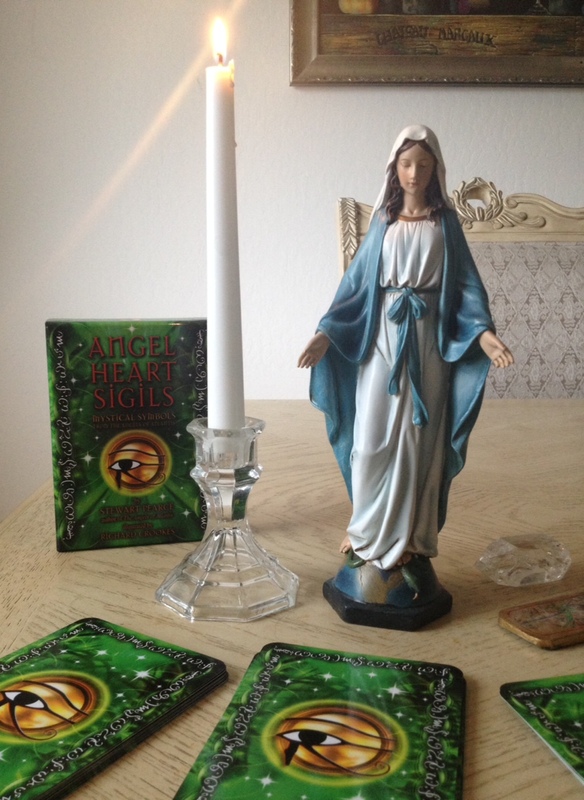 While there is a deep mystical weight to the Angel Heart Sigils oracle cards, I wouldn’t categorize it as esoteric and instead, is really well tailored for mass consumption. It seems to be a deck that would be at its most effective for personal devotional work and readings for yourself. If you practice channeling or mediumship, this could be a great tool to try to work with, especially in seeing if it enhances professional client readings. Ultimately, for me, I felt this deck fell into a strange space between the esoteric-occult traditions of Western mysticism that then borrows bits of Eastern religion for fun and New Age sparkly digital art spiritual consciousness with archangels and Atlantis. Don’t get me wrong– it works. It really works and it’s such a cool deck to look at. It just felt out of my league, to be honest. It would be apt to just write them out, first in pencil, then in black marker with the negative space in the corresponding color of pen and try to discover the reasons behind each stoke of the pen in black and how the color hugs its contours in a meditative state while “reaching out” to it with you consciousness and energy “pressing yourself” into the sigil and letting it “push back”… as above so below… All the while going into a suggestive state that is not bound by belief or disbelief. A state of “suspended belief” where your attachments to what is happening around you and if it is “true” or “untrue” and leave instead “pure experience” of the moment “as is” whether it is true or not. Pretend so hard that it is neither… that it becomes your reality… for all is perception reflected. This can connect you to the energies at a much quicker rate than merely looking at the sigils in a deck, especially if you learn better by making stuff with your hands. This Twilight of Belief is essential to all Magickal Workings of That Art which makes the mindful manifest whether one realizes it or not. After the Mindful creation of the sigil with a clear intent on its Pure and Incorruptable Validity and Ultimate Reality of the sigil and the powers it represents is what gives the Magick its “punch”. Like a punch thrown in a boxing match, so must you proverbially aim to thrust your intent past the target to strike it with greater force. Will must be aligned with Love and Wisdom and solid as iron yet as light as a feather… be like water and flow with the Inner Cosmic Force. I forgot to mention that you must suspend the separation of true and untrue on an abstract level but yet live in the moment of it being fulfilled including positive and empowering affirmations. The second part is to forget about it. The third is recognizing when the effects of a working of any type have become manifest in your “event horizon” or “sphere of reality” a.k.a. experience. If you’ve ever done the more intense and deep meditations, self-hypnotism and/or had visions or have gone on “spirit walks” or “vision quests” you will tap into the realms and powers of each angel without much effort at all… if you don’t polish the Inner Mirror of the Heart on a constant basis contact with the Spiritual Dimension of Reality is a bit more difficult but not impossible with some perseverance and discipline of the Body, Mind and Spirit connection you can “talk” to many forms of life you couldn’t even imagine you had the ability to even “communicate” with. 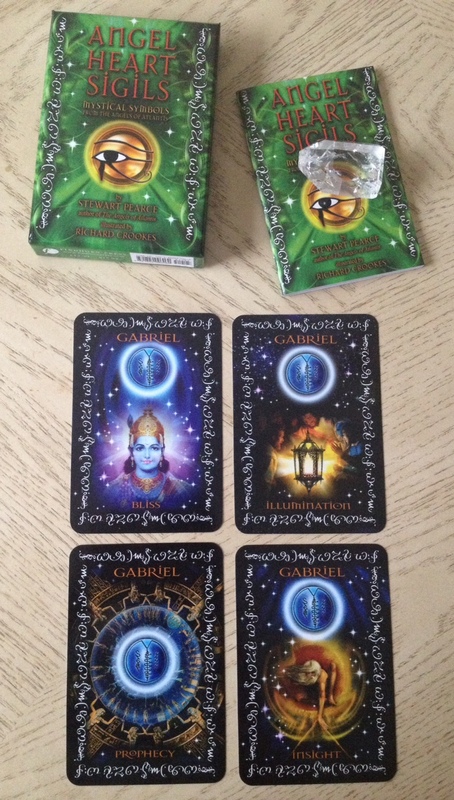 Bottom line is the vibration and the resonance of each card in the deck in relation to each other. 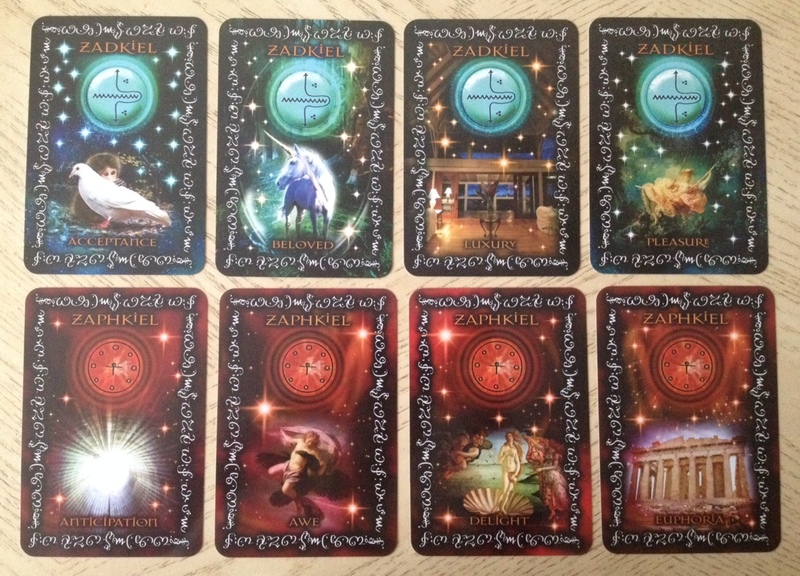 You could use each card as a marker and tool of invokation/envokation of a certain or certain Arch Angels in the four corners of a room or on the center of the four main walls or even each having a set simultaneously. Corners being for your “outer world” pointing outwards and the center of the walls representing the balance of your “inner world” in relation to the goal. 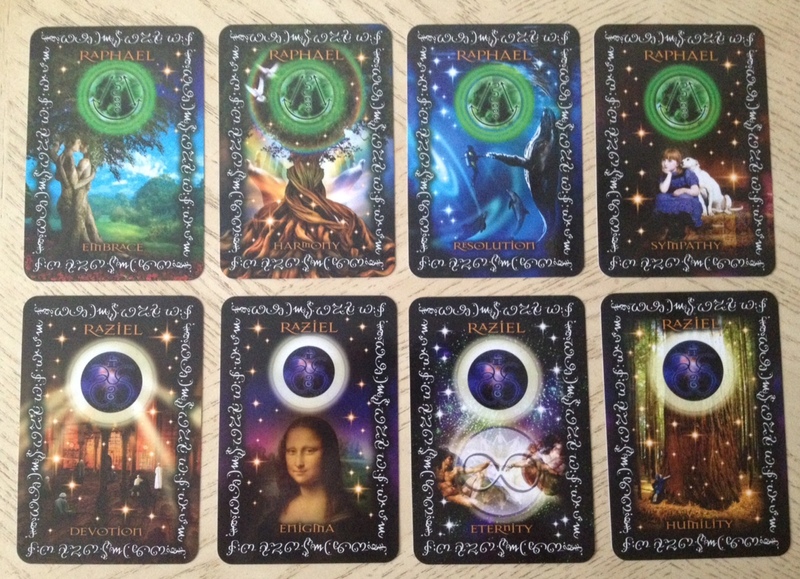 I have to agree that overall I like the decks scheme and vision except for the stars of course…. Should have used real NASA pictures of the Celestial Expanse. That and a more authentic, less cartoony EoH (Eye of Horus) and some explanation of the script as to what it means would also be nice (I personally don’t like using tools that I don’t know the meaning inscribed on them although there have been exceptions). Above all remember that sigils or a symbol of any sort is a kind of Cosmic Phone Number that you can call and get a response from… if one but knows how to open the connection properly.